At Elite Motorsports, we understand the importance of having a car that’s serviced, runs well and provides us with reliable transportation day in and day out. This is why we aim to be Woodland’s one stop shop for wheels, tires, lift kits, suspension systems, powder coating and more. We are committed to providing our clients with the best products and customer service, whether they’re looking for new tires, alignment services or off-roading equipment. For more information, contact us at Elite Motorsports today! Tires are an incredibly important part of any car. Taking proper care of your tires can ensure that they will last you for a considerable amount of time, while ignoring them can not only decrease their lifespan, it could also unnecessarily put you in danger. 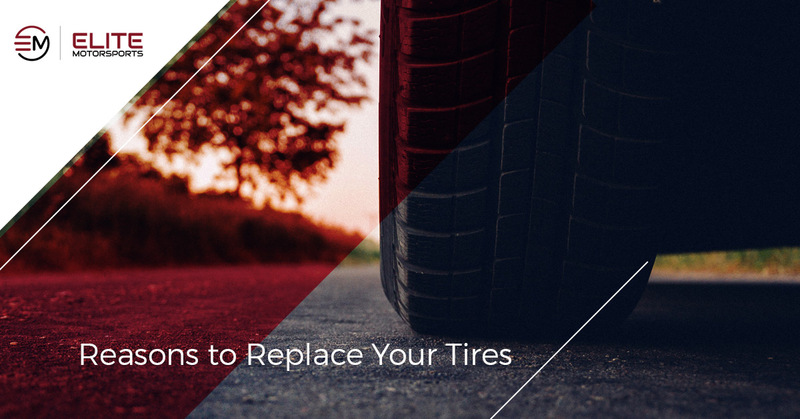 Many people don’t know when they should replace their tires, so in this blog, we will look at a few reasons why you may need to change your tires. Like most parts of your car, proper tire maintenance is key to getting the most out of your tires, both in terms of their performance and their lifespan. While not an absolute, it’s generally true that a brand new set of tires can last anywhere between three and four years, give or take. One good way to ensure that you can get the most of your tires is to have them checked regularly to ensure that they have no punctures or leaks, that they’re set to the proper PSI levels and that they are experiencing even wear. Having your tires rotated will also ensure that no two tires are experiencing heavier wear than others and will aid in your tires’ performance and lifespan. If you live in a climate that receives considerable amounts of precipitation, be it rain or snow, prepare for the wet seasons by getting your tires checked or replaced. If you are currently driving on a relatively new set of tires, but want to ensure the best performance in wet or snowy conditions, investing in a pair of snow tires will increase your car’s performance on slick and slippery roads. This is especially true for those of you who drive cars that are either front or rear wheel drive, because you will need the extra grip during those wet and snowy months. An obvious reason to replace your tires is if one of your tires goes flat. Before replacing the flat tire, however, you should look to see how the rest of your tires look individually. An important factor to consider when replacing a flat tire is to see how the other tires look in relation to wear. Brand new tires typically have between 10-12/32nd’s of tread, and if the other tires still have between 2-4/32nds of tread depth remaining, it is usually safe to replace just the flat tire. When doing this, be sure to match the replacement tire to be the exact same model, size and tread pattern as the others on your car. If the other tires have less than 2-4/32nd’s of tread depth remaining, you will likely have to replace all of your tires. While this may seem like an inconvenience, having that large of a difference in tread wear between the original tires and the new replacement can not only cause difficulty in relation to driving, but also cause larger problems for you in the long run. While the upfront cost of doing so may seem more expensive, the cost of new tires will far outweigh having to deal with costly car repairs down the line. The benefits of four-wheel drive vehicles are numerous — from the increased safety in slick and snowy conditions to to higher resale values, four-wheel drive vehicles are a great choice for anyone who has to drive through less-than-perfect weather during the year. One of the downsides of having an AWD or 4WD vehicle has to do with tires. Because these vehicles have a specialized system that enables it to provide you with AWD or 4WD performance, when you replace one tire, more often than not, you almost always have to replace an entire set. By not replacing the entire set, you can do a considerable amount of damage to your AWD system, as it struggles to compensate for the different tread depths amongst tires. It’s better to air on the side of safety and replace all the tires at once, so as to not endure the cost of expensive repairs later on. Those are just a few reasons why you should replace the tires on your vehicle. Whether you’re looking for a single tire or an entire new set, Elite Motorsports is here for you. For the best in wheels, tires, alignment services and suspension systems in Woodland, contact Elite Motorsports today!